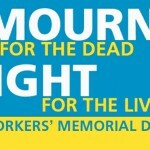 Sunday is International Workers Memorial Day and people will be commemorating the dead in well over 100 events which are taking place up and down the country. In addition there will a minutes silence in many of the workplaces that are operating that day. Events such as the collapse of the Rana Plaza building in Bangladesh earlier this week show that there is still a desperate need for such a day. First indications are that the factory was in blatant breach of safety laws, just as previous factory disasters have been caused by employers ignoring fire regulations. According to ILO estimates, there are 2.34 million occupational fatalities every year, of which 321,000 are due to accidents. The remaining 2.02 million deaths are caused by various types of work-related diseases, which correspond to a daily average of more than 5,500 deaths. This means that far more people die through work than die in wars every year. Yet this is not a issue just for countries like Bangladesh and China, it is still very much an issue here. Let’s not forget that, by the very lowest estimates, over 20,000 people die prematurely in the UK every year because of their work – and the true figure is likely to be much higher. Almost half of these die as a result of cancers, but another 4,000 are killed by other lung diseases. 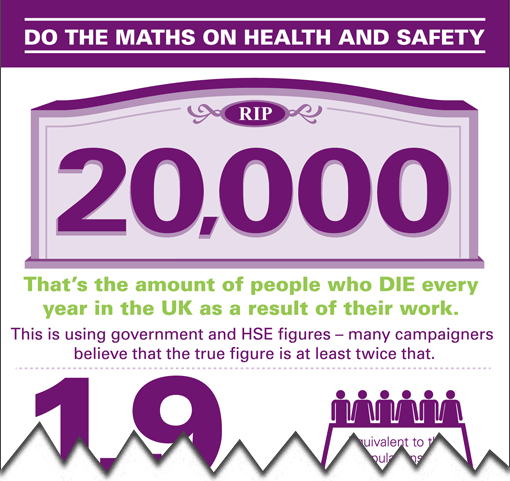 Yet most of these deaths could be avoided if employers simply obeyed existing laws. 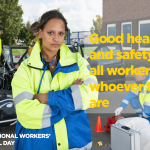 So in a year when we have seen the biggest reduction in health and safety inspection activity in living memory, let us remember that Workers Memorial Day is not just a sombre day of reflection and respect. It is also a day for anger! Anger over all the needless deaths that are being caused now and in the future by government policies that either turn a blind eye to wrong-doing or even encourage it. Whether it is in Bangladesh or Britain, the problem is the same. So is the solution!